Dubai Private Jet Charter offers empty legs in Dubai, UAE. For more information on rates and availability or to book a private flight, please contact us at (888) 987-5387. Chartering an empty leg to/from Dubai is a great way to charter a private plane in the Middle East at a fraction of the cost! Our services are available 24 hours a day, with instant access to thousands of planes and the best deals on flights in the United Arab Emirates! What are Empty Legs, and how are they made? Whenever jets are scheduled to fly without passengers on board, these flights is referred to as ’empty legs’. Also called deadhead legs, they’re created whenever a plane needs to re-position for it’s next flight, which can be for a variety of reasons. An aircraft owner may want to use their plane, and it needs to pick them up. A plane may require maintenance and needs to return to its home airport. Or, a one-way flight might need to fly to another airport to pick up its next group of passengers. The return leg is often included in the price of one way flights. Since the leg is already paid for, operators offer the flight at a discount, the size of which depends on demand or the popularity of the route. Executive and luxury travelers who charter an empty leg can reduce the cost of their flight by up to 50% or more! Read More: What are Empty Legs? Private flights are scheduled around the world on a constant basis, and empty leg specials can disappear as fast as they are created. They’re highly coveted by leisure travelers, charter brokers, and travel agents, all looking to offer their client’s the best deals available. How can you get one of these time-sensitive empty leg deals before they’re gone? Request an empty leg flight from Dubai Private Jet Charter! Our brokers can search every plane on the market, comparing empty legs and transient jets worldwide to offer you the best deal on flights to/from Dubai. The more flexibility you have, the more likely we can find a plane that matches the routing of your flight. Getting locked into specific dates & times means you might miss deals for days surrounding your trip. 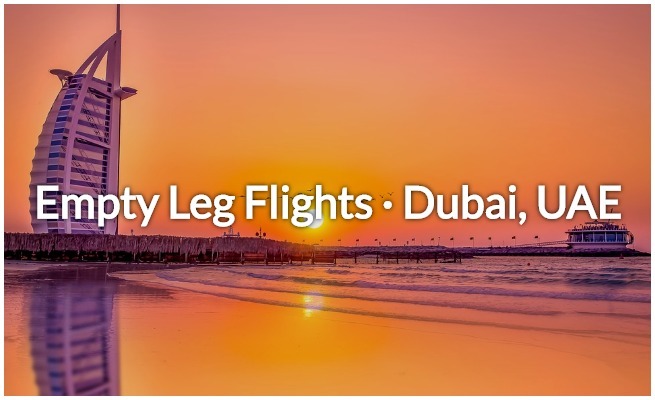 Provide us with your flight preferences (dates, times, airports, etc) and we’ll connect you with the best empty leg deals in Dubai, UAE. Even if we can’t find a transient plane for your flight, we still offer the best hourly charter rates at the highest levels of safety and service in private aviation! We offer around the clock private aviation services worldwide. Receiving a quote is free and easy—don’t miss the opportunity to reduce the cost of your private flights in the Middle East! Call or email us for more details on empty legs to/from Dubai!